Source with a high stored energy driving the rotary movements of the screw. The AC-servomotor transmits power practically loss-free to the screw. This design minimises maintenance requirements while ensuring quiet and energy-efficient operation. 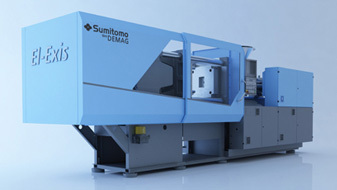 Its decisive advantage: plasticising is possible over almost the entire machine cycle, cycle time is shortened, and output, melt homogeneity, and quality of colour dispersion are higher. Secondly, high speed of injection is achieved by a hydraulic accumulator and a servo-valve. The result: the dynamic response of the linear movement is not compromised, neither during acceleration nor in applying the force by mechanical transmission elements. In effect, with injection speeds of up to 1,000 mm/s and a screw acceleration of up to 12 m/s² the machine achieves absolute maximum values.